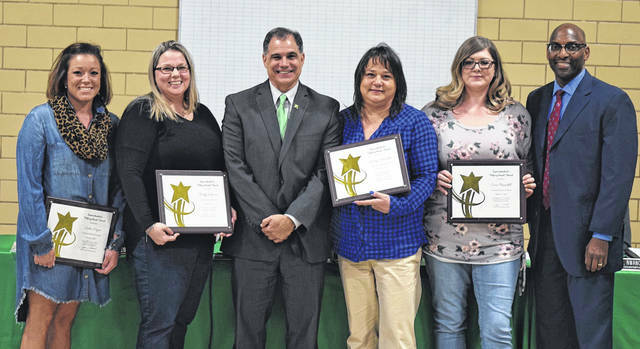 PTO members who have gone above and beyond for students received the Superintendent’s Helping Hands Award at the March Northmont School Board meeting. Pictured left to right is Erika Myer, Becky Johnson, Superintendent Tony Thomas, Lesley Schneider, Cara Brandell and Northmoor Principal David Lawrence. 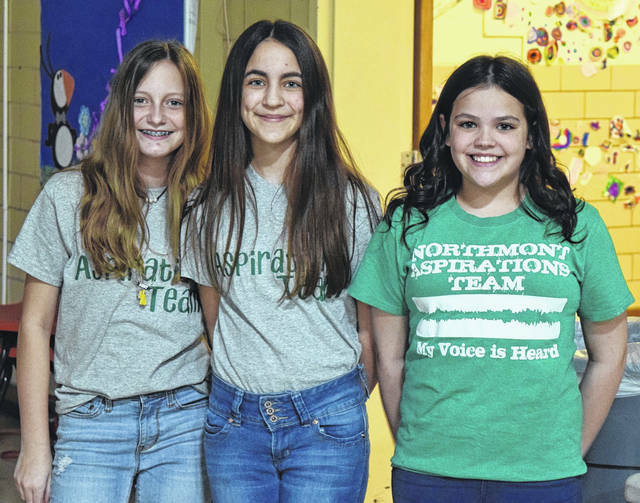 Aspirations students Addy Wissing, Emersyn Wise, and Maddie Hager shared information about Northmoor’s Buddy Bench project with the Northmont School Board. ENGLEWOOD — The March School Board meeting at Northmoor Elementary was packed full of presentations beginning with the Superintendent’s Helping Hands award. Northmoor Principal David Lawrence introduced honorees Erika Myer, Lesley Schneider, Cara Brandell, and Becky Johnson as dedicated PTO members who have gone above and beyond for students. The group has worked hard to meet the needs of students who are economically disadvantaged and to ensure that all students have the same opportunities. Three Aspirations students, Maddie Hager, Emersyn Wise, and Addy Wissing, shared Northmoor’s Buddy Bench project with the Board. Students have been collecting plastic lids to send to a company in Indiana that will recycle the lids to construct two benches. The benches will be placed on the playground. Students who are not feeling included take a seat on the bench and this alerts other students to invite them to join in games or activities. Northmoor students have collected 500 pounds of lids, enough to build two benches. Business Manager Brandon Knecht, along with YMCA Director Josh Haynes led a presentation about the ‘Before and After School’ program offered by the YMCA. The YMCA has been running a very successful before and after school program at the Kleptz Early Learning Center for the last four years, and provided a proposal to the District to also expand their program into the other five existing elementary schools. A side-by-side comparison of Northmont’s current Latchkey Program with the YMCA’s Proposed Program was shared at with the board. Included were references to consistency, curriculum, staff to student ratios, and staff certification. Finally, they discussed the rates of the new program and compared them to the current rates. The YMCA program offers a needs-based approach that may offer relief to parents based on income levels. A public meeting will be held to share the details of the plan. Anyone with questions they would like to have addressed at the discussion forum should submit them to Jwood@northmontschools.net prior to date of the meeting. This will allow time to research the information needed to give the most accurate answers in a timely manner.